Ella is one today. It's hard to believe that one year ago today Ella was born. It's even more unbelievable everything she has been through in just one year. Most people think there babies first year goes so fast but for us there were times that seemed like they would never end. Ella went to the pediatrician today and everything seems good. She is growing well and is now crawling ,she is doing what most babies do at her age. Besides her scar there does not seem to be any lasting affects of all she went through. We are so thankful for everthing God has done for her. We continue to pray for her health, we don't want anymore hospital visits. We will see her cardiologist soon but she just looked at her heart when she was in the hospital last month and everything looked good so we don't expect any changes. Ella will always be our baby. We are definately more protective of her then we were with the other girls. I am so thankful that I can be home with her all the time and we are really looking forward to this summer. Last summer was such a nightmare so we want to make this one special and makes lots of memories with all of our girls. Thank you so much again for all of your prayers. Ella is so blessed to have so many that care for her I can't wait until she is older so we can tell her all about the miracle done in her life. This week we took the girls to a hotel that had an indoor waterpark. We were so excited to see Ella swim for the first time. She seemed to enjoy it. Our whole family being in a hotel room was not so fun. Ella kept waking up and it was waking up everyone. I'm sure she is glad to be in her own crib tonight. She really is such a sweet baby. Ella is now 8 months old. Last month was a big month for her she began rolling over and her two bottom teeth are coming through which makes for a crabby girl. Thankfully she has stayed healthy this winter. We are extra paranoid everytime she has a snifle or cough. Hopefully that will wear off as time goes by. I will feel more at peace once she is big enough to tell us if something is wrong. Until then I am enjoying her as a baby, I know it doesn't last long. Monday Jason took a day off which was his first since christmas, so we wanted to do something as a family. I took Olivia out of school early and we went to great lakes crossing. The girls rode rides and played games at jeepers then we had dinner at rainforest cafe we hadso much fun it waas like we were on vacation. We saw that carnival cuts does ear piercing so we decided to take Ella. We had tried to get Ella's ears pierced twice already and it didn't work out so we figured with everything she has been through we would just wait. This time it really happened. Like her usual self she was all smiles when we went into carnival cuts. She obvisiously did not know what was coming. She was really still when the girl put the marks on her ears for placement I thought she is going to do really good. The girl was ready to get started Olivia asked if we were going to lay her on the table and hold her down. (: I had Ella on my lap and they did one ear at a time I had to hold her head still. It went really quick but she was not happy. ): She definately screamed louder and longer then any of my other girls. Jason picked her up and held her tight and he relaxed her to sleep. She looks so cute with her ears pierced and I think that was easier then if my girls were older. Ella is doing great we recently went to her cardiologist and her heart looks good. She is off all her meds now and does not need to see the cardiologist until she is one. We were so glad to hear it. She is getting big, she laughs alot and is always smiling. She even says dada . I think with the third you really realize how fast they grow up I can't believe how quickly she is hitting those milestones it's so sad. She is such a great baby. Ella is eating baby food now she will eat whatever we give her she even ate the prunes. I can't beleive she is already 6 months. Time flies she is not the baby in our family anymore. My sister just had her baby on Christmas eve ,Ella seems so huge now but to me she will always be my baby. I find that I baby her more then any of my other kids probably because of all that she went through. She still wakes up in the night and I give her a bottle the doctor says I should stop that, if it were my other kids they would have had to cry themselves back to sleep. I may regret this if she's two and still waking up in the night. Ella enjoyed her first christmas. She loved opening her presents and she has been having fun with her new toys. Last night we went to Candy Town at my parents church. Ella had a good time with her sisters watching them play games and get lots of candy. The girls enjoyed being with there cousins and grandparents and we got to catch up with old friends. 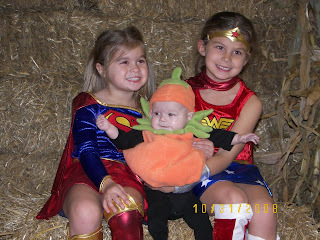 Ella was such a cute pumpkin. Olivia was wonder woman and Alexa was supergirl they had so much fun. Last weekend my sister Jenn and her daughter Jordan were here for a visit. It was the first time they met Ella. We had a good visit we painted pottery and went shopping and to the cidermill. Olivia just loved having Jordan around. Ella is doing good she is getting big . She's ready for some food now I think I will start it soon. She even will sleep 12hours at night,only sometimes. I think she will roll over soon that will be cute. We can already tell she will be quite a talker and she loves attention. I know I am so bad it has been a month since a blogged last. Olivia and Alexa are back in school now and you would think I would have more time. I really need more hours in a day, who doesn't right. I am trying to spend more time with Ella while the girls are away at school but I can't always find the time. Ella is still waking up in the night ,some nights are better then others I am definitely ready for some uninterrupted sleep. She is started to get a little chubby it's so cute. 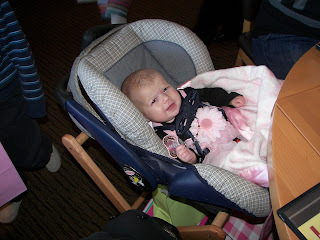 She really is a happy baby always smiling and laughing. Health wise she seems to be doing well nothing new. She will see the cardiologist soon she only goes every three months I wish it were at least every month so we could make sure everythings good in there this feels like the longest three months ever. Olivia and Alexa are doing good with her. As soon Olivia gets home she can't wait to hold her Alexa is starting to get a little jealous hopefully she will get over that soon. 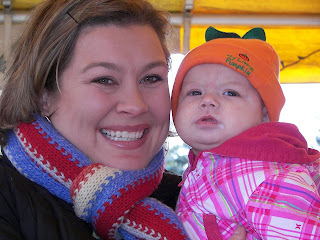 Today we took Ella to the cider mill she really enjoyed picking apples. It was such a perfect day Ella and her sisters picked a ton of apples then we went home to make an apple pie. I have never made a homemade pie before. I definitely learned what not to do for next time. It looks kind of ugly but it tastes pretty good and thats all that matters right? LOOK WHAT I CAN DO NOW! I know that I am the worst blogger ever. We have really been enjoying our summer, its been keeping us busy. The kids will be back to school soon so I will hopefully have more time to enjoy Ella. She has been doing great! She started sleeping about 6 hours straight at night which has been nice for me. We are so excited that she started sucking her thumb it looks so cute. We have really been getting a routine down now. She is very easy but when it gets to be bedtime she prefers being home. She had a visit at the pediatricians and got some shots, she didn't cry too much. Her scar is healing well it actually looks more noticeable now then when it was first there but I'm sure as she grows it won't look to bad. She will not see the cardiologist for two more months. She is still taking her meds, we can't wait until she 's done with those it's becoming a pain. We can't get them refilled at a regular pharmacy we have to go to the hospital once a month for refills. She's just about 3 months can you believe it. She's getting big always smiling and laughing she really is such a sweet baby. Ella loves her sisters. She is doing great. She's getting so big . We have a good routine down she is the easiest baby ever. Ella only cries when she's hungry or ready to go to sleep. She loves her swing (thanks Auntie Mel). Our days with Ella are pretty relaxing she is eating every three to four hours and she just eats then she will smile and laugh a little and then she wants to go back in her swing to sleep. She goes down for the night good and wakes up a few times during the night. Last week some of her cousins came over for a play date and she went to dinner with her friend Hayleigh who was in the hospital having a heart operation at the same time. Hayleigh is doing well we look forward to seeing her again soon. Saturday Jason and the girls went to our church picnic, they had a great time. It was Jason 's first day out with all three. He had no problems, he's such a good dad. Our summer is winding down but we feel like it's just begun. Ella is doing great. She had an appointment with her cardiologist this week. She had an echocardiogram done and her heart looked good. It's beating good and everything is healing nicely. Her blood pressure is a little high. Not so high to put her on medication just yet but when she goes back in a few months she may need to get something if it's still high. We need to pray that it drops. Blood pressure medication for an infant is not that good for her. She went to church on Sunday for the first time. We also took her to the zoo last week with her sisters she really enjoyed it. Jason and I would like to thank everyone for all of their prayers and encouragement and helping with the girls. We really appreciate it. The prayers were really felt through this whole journey. I know that without our faith in God we really would have felt hopeless , but He brought us through it and we just had a supernatural peace. We knew she would be fine it was just difficult seeing her go through it all. 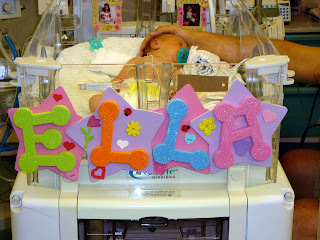 The blog has been a good way for people all over the country to keep in touch and be able to pray for Ella. We have family all over and I know their churches and friends all knew about Ella. It's so awesome that people we don't even know were praying for us. This has definitely been an experience that I hope we will never have to go through again. We really don't know what we would have done without all of you. We are so thankful. We could see Gods hand in this situation all the way until the end. He brought people into our lives at all the right moments to help lift us up , people that could understand what were going through and it really helped us feel better. His timing is so perfect. He knows what we need when we need it. We are so glad to be home now. We will try to enjoy what is left of the summer. I will keep the blog going with pics of Ella and what she's been up to . Thank you all again. Sorry I have not posted in a while I have been having some computer difficulty. Ella's been home over a week now and she's doing great. She has been taking her meds good and eating alot. She had a nurse come to the house to check her out. 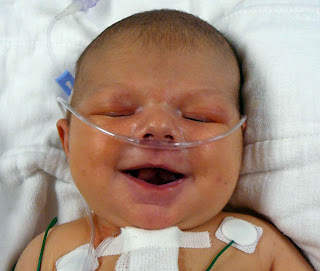 The nurse checked her oxygen, listened to her lungs and weighed her everything is great. 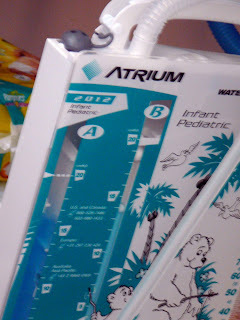 Then the next day we went to childrens hospital for another x-ray. Her lungs looked good, no more fluid. 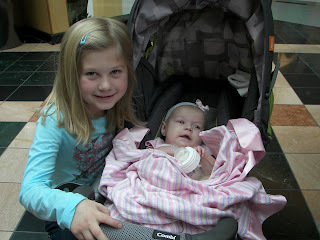 That is her last visit to childrens now we will only go back for social visits. The girls are doing great with her. They keep fighting over her. They think I should of had two, one for each of them. Ella is more then enough work though. I have been getting used to her feeding schedule. The newborn stage hasn't been to bad. I think with already having two other kids I was used to not getting any sleep. She went to the pediatrician this week they were so happy to see she was doing well. They were the ones who first seen her when she got sick. She's like a celebrity there. Everyone knew her name. She's getting so big. I am still fortifying her breast milk with the extra calories. It's definitely working. The doctor weighed her and she is 9lbs. 2oz. Next week she will go to her cardiologist. The only place I've been going is to the doctors it seems. We plan to start venturing out soon and enjoy our summer. Yes it's true our precious Ella is home. We picked her up around 4 p.m. She had a nice little coming home party with her grandparents and aunties and cousin. It's so good to have her home it has been a long three weeks. I think Ella is really happy to be home and sleep in her own bed. We thank God for making her whole and bringing her back to us. Her sisters are so glad to be able to see her everyday. We are looking forward to spending the day together tomorrow as a family. I will post back soon on how she is doing and with some new pics of her days at home. 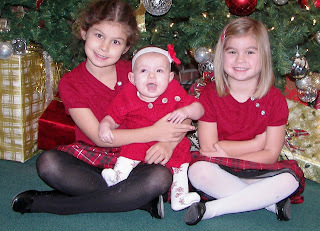 Here she is at home with her sisters we are so blessed to have three beautiful girls. The tube is out for good this time. She should be able to go home tomorrow of course the doctors still can't say for sure nothing is definite around here. She will need another x-ray in the morning just to make sure everything still looks good and then she's outta here. The doctors want to see her on Wednesday for another x-ray. I guess because the draining stopped so abruptly they want to be sure it doesn't start again. Tomorrow will definitely be a day to celebrate. God is so good. He brought us through this hard situation that at one point felt like it would never end. She looked so good today just like her old self again . We can't wait to have Ella home again so our family can be whole. I will post back tomorrow with some good news. Here's a pic of Ella she was trying to break out of her crib today. I just got off the phone with Ella's nurse and she said that she did not drain all night. She thinks they will take the tube out tomorrow and she will go home this weekend. I will get a more accurate report when I get there. We are so excited thank you for all of your prayers. Keep it coming she not home yet. I'll post back later with more details. Today was a good visit with Ella. She did not drain at all while I was there. Jason went tonight and she still has not drained we really hope this means she is done we will know more tomorrow after her x-ray. 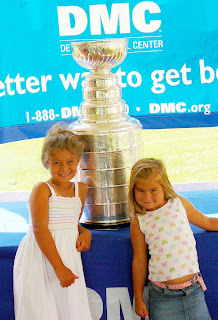 Today at the hospital the stanley cup was there so the girls had there picture with it. It was pretty cool they brought it in for all of the patients and siblings and employees to have there picture with it. I will for sure post back tomorrow hopefully she is done and we can prepare for her to come home. So its been 10 days since the surgery and she is still draining fluid. The doctors agree that this is a long time and they have no idea why. Everything else looks really good. She is healthy but she just keeps draining. Her surgeon thinks that she could just suddenly stop draining one day soon without having to decrease her fluid but he has no idea when that could happen. I am praying that when I go in tomorrow morning that she will be done with this. We really want to bring Ella home. It's hard being here without her. She looked so cute today the nurses put a little outfit on her. I'll post back tomorrow with some good news hopefully. The tube is back in. This mornings x-ray showed more fluid on her lungs so they need to put the tube in. She will have another echo to see if the fluid returns if it doesn't come back again then the tube will not be in for long. Hopefully we will be taking Ella home soon. It was good being at home last night but Us and the girls really wish Ella was there. I will post back with any changes. I'm believing for some good news later today. I hope everyone has not been freaking out since 2 p.m. about the x-ray. I am so sorry I got back to you so late we've been kind of busy. Her x-ray showed a little more fluid around her lungs but her vitals are still pretty good. 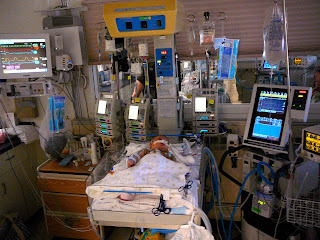 They moved her back to the PICU so the cardiac team can keep a closer eye on her. So far the doctors do not feel the need to put a tube back in, she will have another x-ray in the morning. We have left the Ronald Mcdonald house. We decided to go home now and be with the kids and just commute back and forth to the hospital. I think this will be good, I feel better already. I think us being at the hospital so much was starting to make us a little crazy. It's good to get back to a little normalcy plus I think we will get a better nights sleep. I'll post back tomorrow afternoon with what's new until then please continue to lift Ella up in your prayers. We really do appreciate it. At 10 p.m. last night Ella had another x-ray and it was the same as earlier which was good. At 5 a.m. she would get another one. When we arrived this morning they had done another x-ray and everything was the same she is still eating good and her vitals are good. She also had an echocardiogram and the fluid around her heart does not seem to be that much to worry about. Her doctor came in and said that she has fluid around her lungs that is more of a concern. At 2p.m. they will do another x-ray and if the fluid around her lungs has not increased then they will not do anything but if it does increase then she will need another tube. Please pray that she will not increase her fluid we just want this to be over. I will post back after 2p.m. with the update. Remember when I told you nothing exciting was going on today? Well it just got exciting. I was feeding Ella and I heard a bubbling sound and she was crying so I went to unwrap her blanket and I seen the end of her tube that was supposed to be in her stomach. We immediately called the nurse over and they called the doctor he came in right away and they put a bandage over the hole and ordered an x-ray. The x-ray looked good and her vitals look good. She will have another x-ray tonight to see if the fluid is started to build and if that happens they will need to put the tube back in. Please pray that she will not need another tube. I guess sometimes the fluid could just dissipate and then she would be fine. She must have had enough of that tube I think she really wants to go home. We will update if we get some new info. Ella's doing good today. Her lung still looks good I don't think it will be an issue anymore. She is still draining alot we really need that to stop. She is losing some weight, the doctors would like to see her start gaining before she goes home. Jason and I have been having a relaxing day just hanging out with her. There's nothing really new and exciting going on. Her incision looks really good. We were really surprised how good it looks. We don't think it will even be noticeable as she gets bigger. We have really been amazed with the talent and knowledge that God has given these doctors they are really able to do some incredible things these days. Sorry for the late entry. Ella's lung is back to normal, thank you all for the prayers and words of encouragement. We had a few visitors today, Ella was very excited. Earlier today Russ and Rebecca Hozen came by, followed almost immediately by my (Jason's) parents. We also just received a call from Lori Bunk letting us know that her and Chris are making there way over when Chris gets out of work. This day seems to be flying by. The kids just left with my parents and are on there way to my Uncle Jimmy's house, they were getting a little stir crazy here. Well back to talking about Ella, she really looks good and she is eating well, the only think keeping her here is her chest tube is still draining quite a bit. The doctors and nurses are saying it is normal and the fluid looks good. It is just hard for us when we thought we would be going home now. But it is better to double and triple check everything here before we take her home. So what they are telling us now is that it will be a few days before she stops draining and then we will need to stay at least twenty four hours before we can go home. They are hoping for monday or tuesday, but we are believing for earlier. Check back soon for new pic's. I am so exhausted. Today was a little hard for me . I just feel so tired and we still have no idea when we are leaving. When we went to the hospital this morning we found out that Ella's lung is collapsed, it is a common thing to occur when babies have tubes in them. The incision that the stomach tube is in must have gotten some air in it and it caused a lung to collapse. Ella will have an x-ray in the morning and we believe that the lung will be back to normal. She is still having some drainage so he tube is still in we really want that to stop draining so we can leave. Please pray for us . We really need to go home. Besides the first couple of days today is probably the hardest ,this situation is starting to wear us and the kids down. We did take a little break today with the kids. 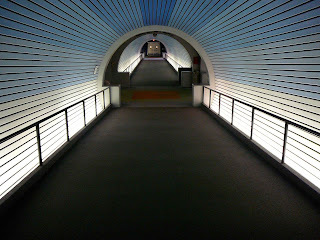 We went to the science center it was a nice time but we wished Ella was with us. 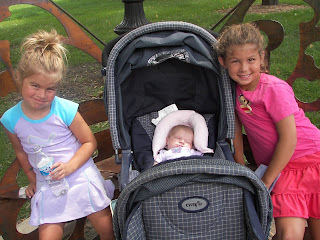 The girls are back from greenfield village. They had so much fun with their Dzia Dzia. 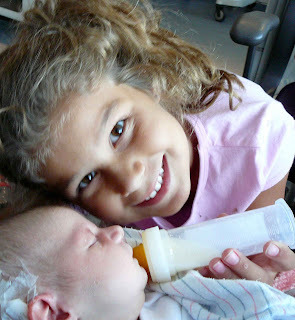 They got to spend some time with Ella and feed her a bottle. The girls can not wait for her to come home. We had dinner at the Ronald Mcdonald house tonight. A group of high schoolers came in and made tacos. Tacos are Olivia and Alexa's favorite they really enjoyed them. It was nice to sit down with the girls and have dinner. After dinner the girls hung out with Jason and watched a movie. I went back to the hospital to feed Ella. She is eating so good. She seems so comfortable and happy now. I got to rock her to sleep. She was sleeping soundly when I left her. I hope she has a good night and doesn't give those nurses to hard of a time. Everyday we are almost in unbelief of how well she is doing. 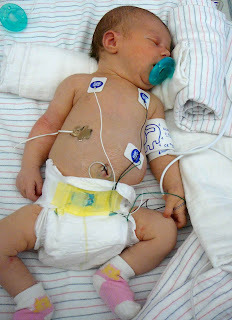 I can't believe that she just had open heart surgery 5 days ago. She seems like a healthy, beautiful newborn. She doesn't even seem fazed by anything she has been through. ELLA'S MOVE: today Ella got moved back to the NICU where she first started. She is moving in the right direction. She will be discharged from the NICU. We are just waiting for her drainage tube to stop draining. Once that stops they can remove it and the following day she will be discharged. So as of today she only has a pic line in her head, which is like an I.V. ( they are only keeping it in just in case they if something happened and they needed to give her something intravenously) and she has one drainage tube in, so she is started to looked more like our Ella again. Today has been a relaxing day the kids went with my dad to greenfield village and Jason went to work for a little bit. Everyone will be back soon. Jason's dad just left, he was here for a little visit with Ella. Our new friends Eric and Michelle got to go home just now, today is their daughter Hayleigh's first birthday. I'm so glad she gets to be home for her birthday. Hopefully we won't be to far behind. I can not believe we have been here for eleven days. I can't wait to go home. Today Ella is doing good she is off of all of her IV's she is getting better quickly. A nurse had mentioned maybe Wednesday she could go home but we have learned not to get our hopes up. She is only on some oxygen, has one drainage tube left and a couple of oral medications which she will need to take at home also. The girls are here now they will be staying with us probably until we get home. They got to visit with Ella today. I am glad they are here we just have to keep them busy while we are here. 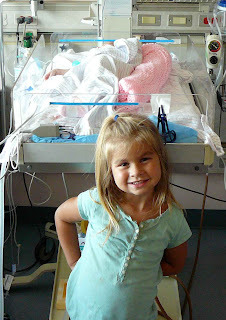 There is all kinds of different things for siblings here at the hospital. We are going to take the girls to dinner now. It is now two days after her surgery they will definitely take her off the vent today. We came in in the morning and she is still sleeping. As soon as she wakes up they will take the vent off. The doctors took some of her tubes out and wires off. About three hours went by and she is still sleeping . We are eagerly waiting for her to wake up . We have been trying to get her nothing is working. By about 5p.m. she finally wakes up. Yeah they took her off her vent she is alot happier now. She can have a bottle of pedialite and then for her next feeding she can have a bottle. It is about 7p.m. and we are going to leave the hospital for dinner. We have gotten to know another couple that has a baby here. We are going to go to dinner with them to this thai restaurant that is in the eastern market. Our new friends are Eric and Michelle they are great we have alot in common with them. We had a good time at dinner the food was great and it was good to get out of the hospital. It was fun getting to know our new friends they have four girls, their youngest is here she just had a heart operation on Thursday she also is doing well. After dinner we went back to say goodnight to Ella she is resting peacefully. Today we woke up early to see how she is doing after the surgery. She seems to be progressing very well. The surgeon wants to lower her medications and take her off the vent. She is still very drugged and has to wake up more before they take the vent off. Hours went by and she is still sleeping plus she has alot of fluid in her so the doctors want her to get rid of some of that fluid before they take the vent off. Maybe they will do it tomorrow. We pretty much have just been hanging out today nothing too much is going on. We are going to bed early we will be back in the morning. SURGERY DAY! We have been waiting all week for this. We spent the morning holding her, she seemed very relaxed. They would bring her down to the O.R. around 2p.m. Her grandparents all came by to hold her before her surgery. They took her to the O.R. at 2p.m. and we gave her some kisses before they wheeled her in. Now we will wait for about 7 hours. Today will be a long day. All of our friends and family have given us so much support and prayers we really have appreciated it. And I know those prayers have been answered. We spent our day in the waiting area in the O.R. a nurse came in to update us when they stopped her heart, when the surgery began, and when they started her heart back up. The doctor came in about 5 hours later and said it all went well, the nurses were closing her back up and we could see her in about an hour. When it was time to see her I felt nervous I was not sure how she would look. But she looked really good a lot better than we expected. The nurses were bringing her up to the pediatric ICU where she will recover the next few days. About an hour and a half later we were able to visit her, by now it is around 9 p.m. She really is doing well they said. After they started her heart again she had an arrhythmia so they would just monitor her trough the night. It was hard to leave for the night but we really needed to rest. We would return early in the morning. The surgery is done now we will be praying for a fast recovery. We hope to bring Ella home soon. Today we will meet at 1 p.m. with the surgeon, he will explain how he will do the operation. We were hoping they would only operate on the coarctation and have to work on the VSD. 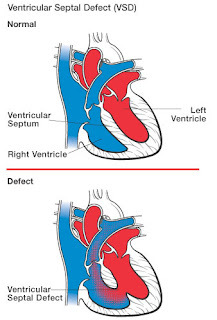 Sometimes a VSD does not require surgery because it will close on its own. Ella's hole however was very large and did not have a likelyhood of closing. 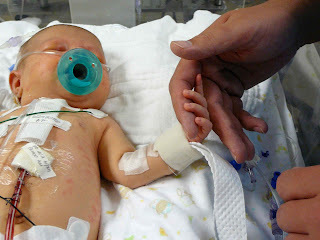 With having to do both procedures it would require open heart surgery which made us more nervous. All of our parents came to meet with the surgeon. After meeting we felt real comfortable with the surgeon and what he was planning on doing. He was confident that everything should go well. The surgery was scheduled around 1 or 2 tomorrow and she would be in surgery for about 7 hours. Ella had to stop her feedings around 3a.m. to prep her for the surgery. We expect she will be cranky in the morning because she can not eat. Today is wednesday just a few more days until her surgery. We do not expect many changes today she is doing good still now we will just spend time with her. The surgeons assistant came by to set up an appointment to meet with surgeon he will then explain exactly what he will do in the operating room. We will meet with him on Thursday at 1p.m. 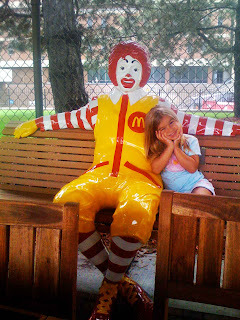 We will continue to stay at the Ronald Mcdonald house probably until Ella can go home. The Mcdonald house is an interesting place. Olivia thinks we are staying at Mcdonalds. It is a house with 25 rooms , a couple of living rooms to relax in, a kitchen for everyone to use, a play room and garden area outside. Our room consists of a couple of beds with a sink. We share a bathroom with another room. The house will supply meals sometimes. Different churches or organizations come in to prepare meals and if you are around the house you can come and eat. We pretty much wake up and come to the hospital, then come home at night and go to bed. We don't ever hang out at the house, some people do though they act like they are at home but for some people they are at home, if their kids are very sick they could be here for months. Today is Tuesday we hope to have a surgery date. We came in to see her this morning se is awake more now, she looks good I get to nurse her now she is eating really good. We have a routine down now we get to the hospital around 8 a.m. come in to visit with her while the doctors make there rounds. When they are rounding we get an update on how she is doing, then we hangout in the lounge for a bit and have breakfast. I am feeding her now so I go in every few hours to feed her. The days really fly by I don't know where the time goes. It is now about five o'clock the surgeons are finishing up there meeting. The Cardiologist came in the room and says her surgery will be later in the week maybe Friday. Of course they can not commit to anything everything is tentative. Jason and I feel kind of disappointed we really wanted the surgery sooner it just means more waiting. At least she is doing good and getting healthier everyday. The kids came to see her today I was a little nervous how they would handle it. They did just fine they got to spend a little time with her. It was good to see the kids we really miss them. My mom got in town last night so she is at the hospital with Jason's parents also. It nice to have some company today. In the morning in the family lounge people start waking up around 6a.m. and everyone fans out in the hospital to see how their children did through the night. 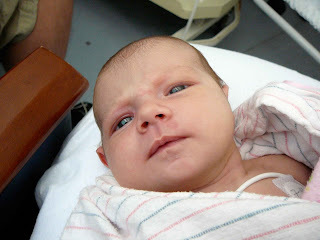 Today is Monday we were anxious to see what her Doctor and Cardiologist had to say. We were eagerly awaiting for a surgery date. We just wanted her heart fixed so we could work on getting her better to go home. When we went to her room that morning she looked good. Better than she had previous days anyway. I got to hold her and feed her myself that was exciting and she loved being held. The doctors came in and said she looked good and she was ready for her surgery. The Cardiologist told us that the surgeons hold a conference every Tuesday afternoon to discuss the upcoming surgeries and after that meeting they should have her surgery date. One thing we have learned around here is that they can not guarantee anything even if she has a surgery date. Unless they are wheeling her down to the O.R. they can not say for sure when she will have her surgery. Right now she is stable so if a baby comes in that needs immediate attention she would be bumped. We are hoping her surgery would be Wednesday,now we will wait until Tuesday to find out. It seems like alot of waiting . We got a room at the Ronald Mcdonald house for the night I can't wait to get some sleep. We arrived back at the hospital around 8 a.m. feeling more rested than the previous night and a little more relaxed about everything happening. The doctors made there rounds that morning and decided to aggressively turn down her meds and they planned on taking the vent out . She was moving toward the right direction for surgery. 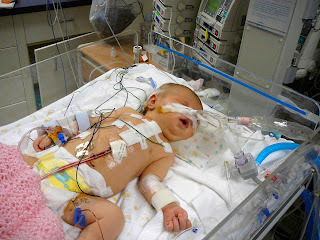 Later that day they took the vent out and started giving her bottles shortly after that. 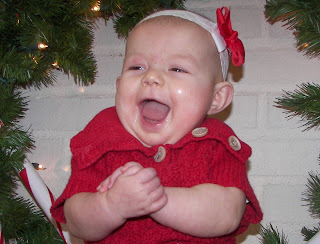 Now she was a happy baby. That night we had to stay in the family lounge. We were trying to get a room at the Ronald Mcdonald house but they were full. We would try again tomorrow. The family lounge is a very interesting place. There are quite a few people that stay. Every night people grab a pillow and blanket and stake out there area to sleep. Your options are a recliner, a bench that is slightly padded, or the floor. Around midnight the lights are dimmed and everyone tries to sleep. I told Jason it felt like an adult lock-in. We chose the bench to sleep on. We would wake up in the middle of the night to change positions because our body was going numb. The morning could not come fast enough. After a long unrestful night we did not know what to expect for today. She was responding well to all of her medications so the doctors began lowering her dosages down. The doctors goal was to ween her off of as much things as possible because the surgeons would be more apt to do the surgery sooner the better she seemed. Today is saturday and her main doctor and cardiologist would not be in until monday and we were hoping to get a surgery date. By the end of the day we needed a break and some sleep. We went to dinner at my parents and spent some time with the kids then we went home to pack some thing and get a little rest. Nine days after Ella was born she wasn't hardly eating and was not awake very much. After 24 hours of this we worried there was a problem so I took her to her pediatricians the morning of Friday June 20 at 9 a.m. her temperature was 94 degrees and she was breathing very quickly and looked a little pale. From the doctors office they called 911 immediately. An ambulance came and took her to St. Johns Hospital, we still had no idea what was wrong. At the St. Johns Emergency Room they decided to intubate her immediately, because of her rapid breathing they were concerned she may tire out and stop breathing, by now we were told it may be an infection and they were going to test for meningitis. After many attempts to get an iv in her (having trouble finding a vain) doctors then moved her to another part of the hospital where they put the breathing tube in but before they did they asked us to leave the room and we were met by the chaplain. It was a very difficult time. After we waited a while a nurse came in and told us to go upstairs to the pediatric department. 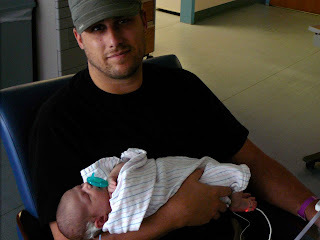 When we arrived at the pediatric department waited awhile longer then a doctor came in and said it was either an infection or a heart condition, a cardiologist was checking her. All the Doctors seemed very concerned which made us more nervous. We were told a number of times that day that she was very very sick. We did not think she could have a heart condition, but within minutes the doctor came in and told us it was a coarctation (a narrowing of her aorta) which caused her to not have enough blood circulating throughout her body. 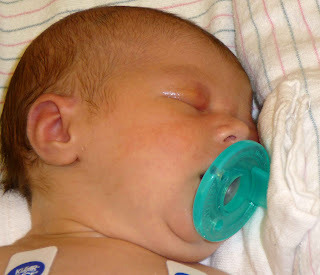 When she was in utero her ductus (a blood vessel that connects the aorta to the pulmonary artery) which was opened and within days after babies are born there ductus closes but when her's closed, because of her narrowing of her aorta, she was not getting enough circulation which was causing her to be sick. There is a medicine that can be given intravenously called prostaglandins which will keep that ductus open so she will be able to have enough blood circulating to keep her stable. Also this would give her time to recover if any of the organs that where not getting blood got damaged in anyway but they were worryed that it was to late to re-open the ductus and they would have to do an emediate surgery. By now Jason, his mom and dad, Sharon and Melanie were all at the hospital. Her condition would require surgery which St. Johns could not do, she would have to be transported to either Children's Hospital downtown or U of M in Ann Arbor. We had minutes to decide, we chose Children's because we've heard they were good, they are closer to our house plus they specialize in children. St. Johns called the hospital to make sure they had room and to set up the transport. The nurses told us that children's would send a team of doctors and nurses to pick her up and transport her to Children's. Jason and I went down to the hospital ourselves followed by his parents and Melanie and Sharon. Once we arrived at children's hospital the girl at the desk said the transport team just arrived but it would be a little bit before we would hear anything. We went to the family lounge to wait Jason parents were already there and so was Pastor Terry Carlson. After about an hour Dr. Bedard (the head pediatric doctor in the NICU) came to speak with us and she moved us into a room for some privacy. There she told us that the prostaglandin looked like they were working but the Cardiologist and other doctors were still looking over her to determine what to do and how soon they needed to do it and also that it would still be awhile before we could see her. 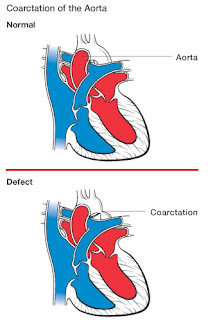 The Cardiologist came in and explained her condition she had the coarctation and also a VSD (ventricular septal defect) also called a heart murmur or hole in the heart. She would require surgery with in the next few days after she had got her strength back and when all her other organs were back to normal (they got pretty beat up from the lack of circulation). After about four hours of waiting we got to see her she looked how she does in the photo above. It was very hard to see her like that, it was the end to a very, very long day. We still did not know everything they were going to do but we were feeling better than we were throughout the day. They did get her pretty stable but she was still in really rough condition and we could not bare to leave her all night. Jason and I took turns by her bedside through the night and we would rest in the family lounge when we needed a break (the family lounge is a story in and of itself we will share more of that later).